About half (53%) of these counties where the Hispanic share of population growth was equal to or exceeded the Hispanic share of national population growth were non-metropolitan counties. By comparison, 47% of these counties were in metropolitan areas. In 2014, about two-thirds (65%) of the U.S. Latino population lived in these counties where the Latino share of population growth at least equaled the Latino share of national population growth. That amounts to 36.1 million Latinos. The Latino population in these counties increased by 11.6 million from 2000 to 2014 – accounting for 58% of the nation’s Latino population growth in this period. 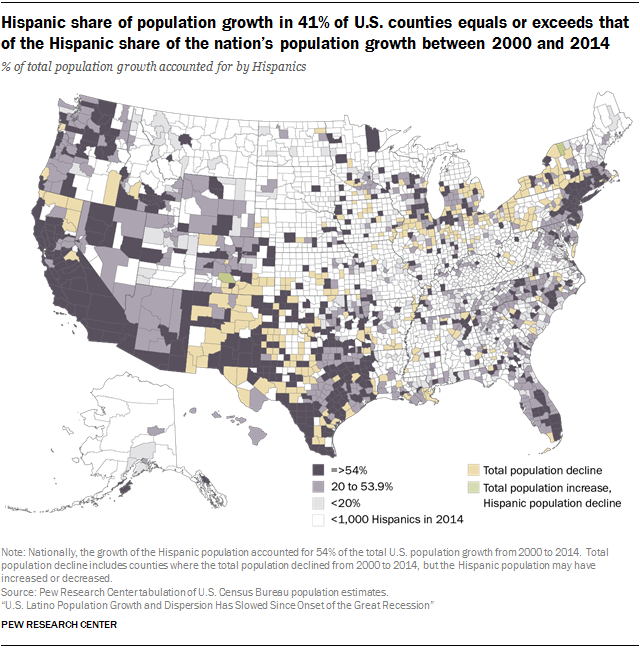 In 475 counties with at least 1,000 Hispanics in 2014, the growth of the Hispanic population accounted for a substantial share of the total county population growth (at least 20% but less than 54%) in 2014. Many of these counties were located in the South (55%) and West (21%). Some 17% were in the Midwest and 7% were located in the Northeast. In 2014, 13.1 million Hispanics lived in counties where Hispanic population growth accounted for at least 20% but less than 54% of the county’s total population growth (and there were at least 1,000 Hispanics in 2014). Between 2000 and 2014, the Hispanic population in these counties increased by 6.4 million. Overall, these counties accounted for 32% of the Hispanic population growth during that time. In 269 counties with at least 1,000 Hispanics in 2014, the Hispanic population growth from 2000 to 2014 accounted for a relatively small portion (less than 20%) of the county’s total population growth. The average size of the Hispanic population in these counties was 10,000 – considerably smaller than the average of 35,000 for all counties with at least 1,000 Hispanics in 2014. But the majority of these counties (211) were metropolitan counties. More than half (57%) of these counties where Hispanic population growth made up less than 20% of total population growth and there were at least 1,000 Hispanics in 2014 were located in the South and 28% were in the Midwest. About one-in-ten of these counties were located in the West and 6% were in the Northeast. In 2014, 2.7 million Hispanics (5% of the nation’s total Hispanic population) lived in these counties where Hispanic growth accounted for less than 20% of the total population growth and there were at least 1,000 Hispanics in 2014. Between 2000 and 2014, the Hispanic population in these counties increased by 1.1 million – accounting for about 5% of the nation’s Hispanic population growth.